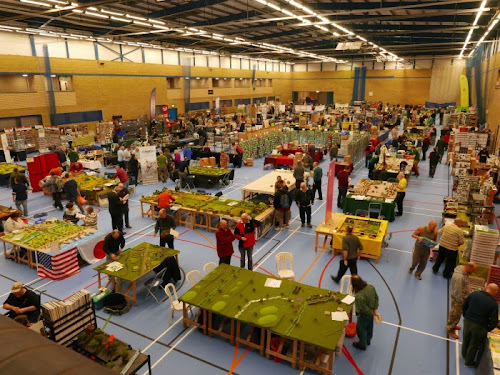 Alumwell, also known as WMMS (The West Midlands Military Show) is a UK show located just outside Wolverhampton. 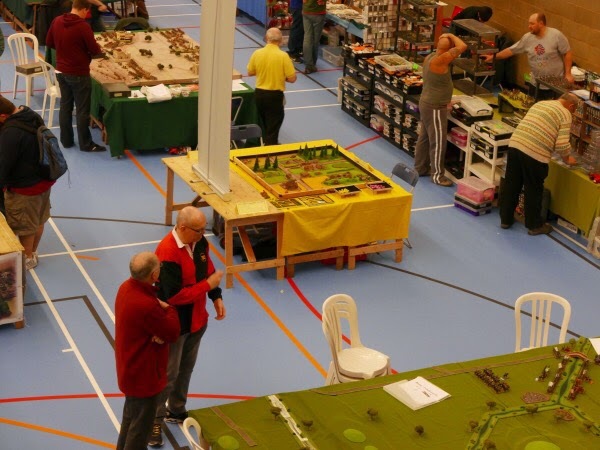 It is a spacious location with plenty of traders and demo games and both contribute to a very friendly atmosphere. This post has some photograpghs of tables and comments on the show from this punters perspective. For the rest of the show report please press 'read more'. Arriving early, the doors were closed with the 10 am opening time strictly observed, so I went upstairs to the canteen for the compulsory bacon balm and coffee. Refreshed after the 100 mile journey, I joined the queue. The entrance cost was £3 - fantastic value. As a punter, I found everything to go seamlessly, so well done to those who did all the hard work to make this show work. From the balcony I was pleased to see that the trend I spotted at this show a couple of years ago of having some smaller gaming tables, continues. 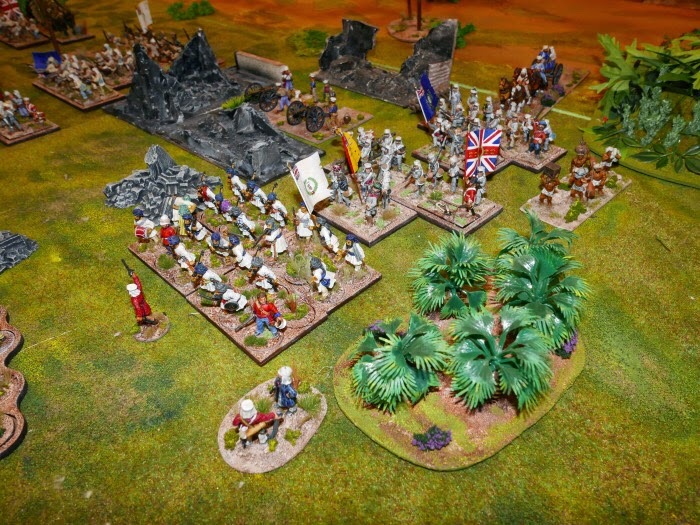 I am a firm believer that the demo games must inspire for punters to then go and spend money with the traders, it seems an essential ingredient of a successful show and I must say, I spent the first hour talking with those hosting the games to get some advice and inspiration - it worked for me. From the outset I must apologise to all concerned with any of the games in the below photographs, I should have taken details to give people due credit and didn't. 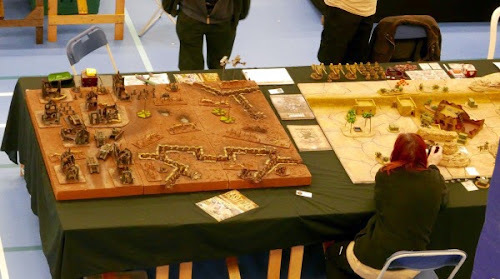 Above - I see this sort of size of table being a more honest representation of what I think ordinary folk are most likely to be playing on at home and so seeing the smaller tables at the show is both welcome and helpful. 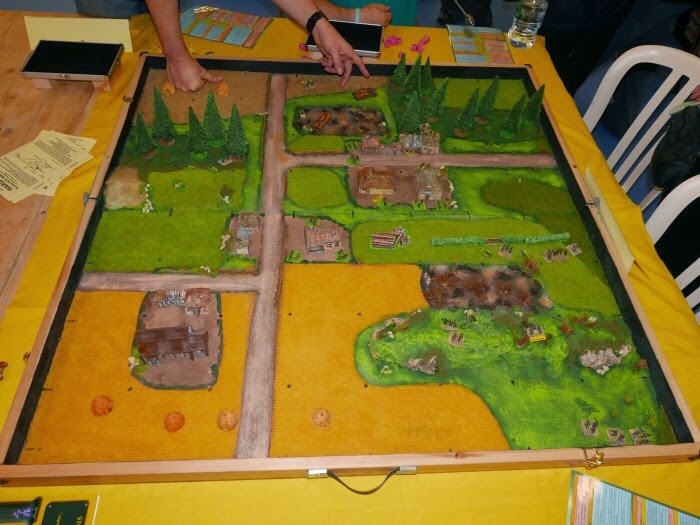 Above - a few traders had their product suported by a demo game and in the centre of this picture, you can see the 4' x 4' set-up of a Peter Pig PBI game. Above - this is the game in closer detail. I think it was a Russian front game as there was a damaged T34 hull embedded in a marsh feature (nice scenic), using the new version of PBI, which Peter Pig were releasing today. It uses 6" squares. The board cleverly folds in the middle using a mechanism similar to a pasting table. Above - another small game using 15mm Napoleonics.... it looks like a famous farmhouse from up here! Above - a Closer look at that table shows the game is played on a throw with a fleecy teddy bear type surface, I should have asked where he got it from because the shade of green does a good job. Above - Another compact game, this time for WW1 on a nicely sculpted and painted board. Above - a closer view of that board. Aircraft pounce, mounted on telescopic car aerial rods, so that the planes can be move to different heights. Above - this is the same board, but with 4 lovely 28mm tanks - not often you see that on a table and all the more impressive that this is being done on a small board. Above - still nice to see the bigger tables though. 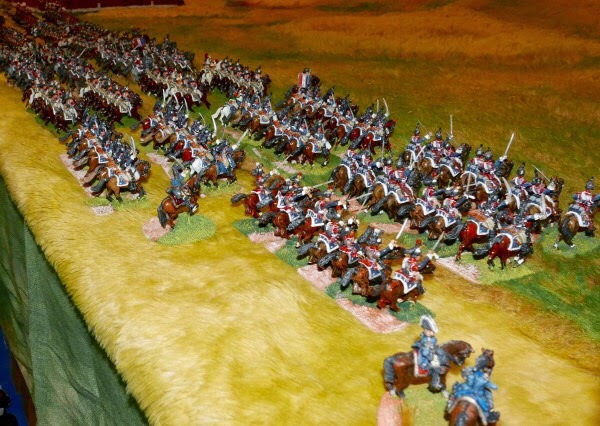 Here are the massed ranks of napoleonic cavalry in 28mm. I can only stand and admire them, beautifully painted with a patience that I could never hope to match. Above - WWII 20mm game (1/72) with the town and square taking centre stage, some really nice buildings here. 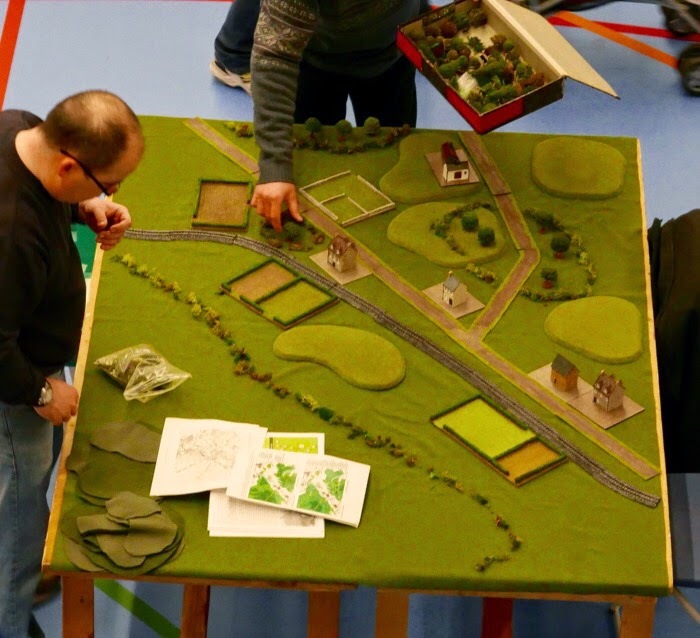 Above - vehicles from the above game entering the board (Puma, StuG and half track). Above - This looks much nicer in the flesh than my camera can show. The flash has tended to blow the contours out, but you can see from how some of the units flow over the slopes that this is a well scuplted landscape. 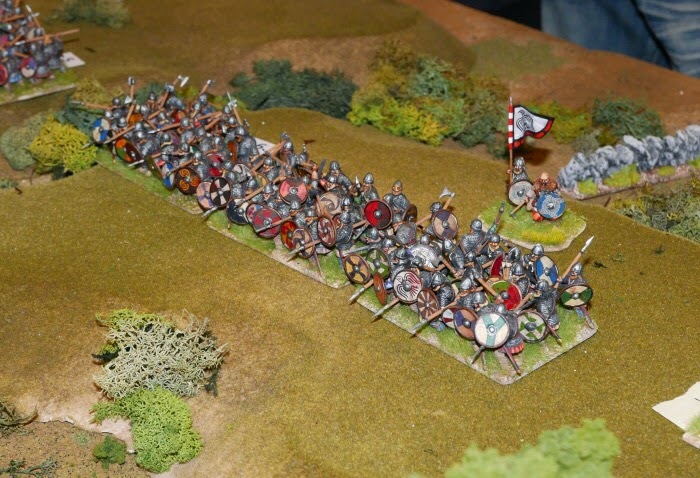 It is a true representation of the battlefield with 6mm figures. 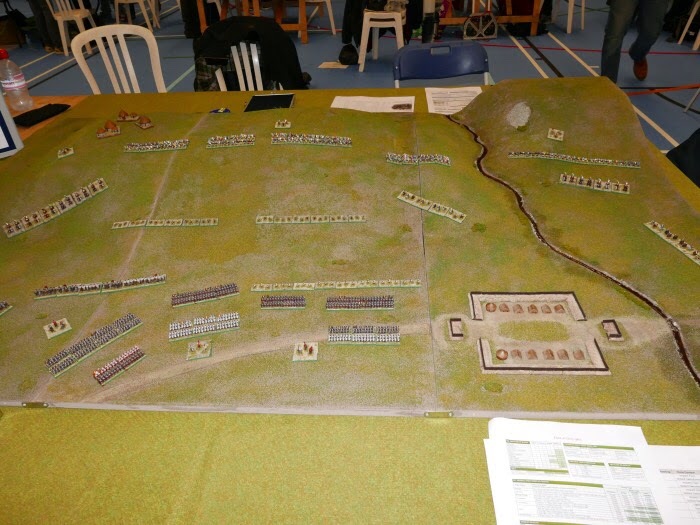 The two gents running the table were very friendly and enthusiastic - this would have had some people making straight for the Baccus 6mm stall. Above - excellent, the smallest board at the show. The depth looked to be perhaps a tad under two foot with 20mm units set up for a firefight. Above - this was a nice combination of well painted figures and nice terrain boards - plenty of texture. Above - this is just a small slice of a very beautiful table. 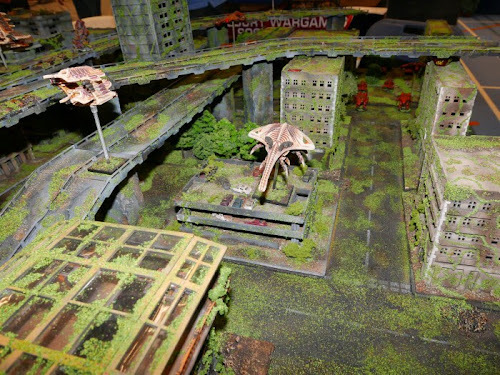 Alien ships pass over a cityscape (with flyovers and office blocks etc) that look to be in a state of abandonment with green vegitation everywhere. This was a stunning looking game and I think any youngster seeing this would abandon their computer and be a figure wargamer for life :-) A table like that only comes with very hard work. 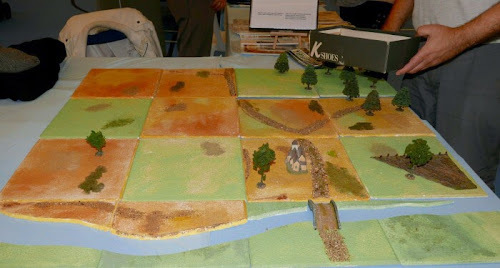 Above - part of a WW1 game, showing Kallistra terrain and figures. Kallistra organised the very successful Hammerhead show last weekend at Newark. 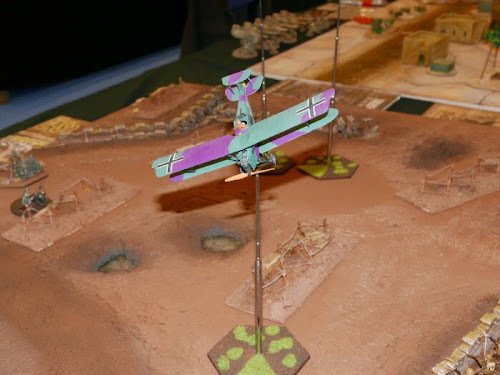 Go to their site to look at their WW1 and other rules sets, which can be downloaded freely. Above - a colonial game I think. 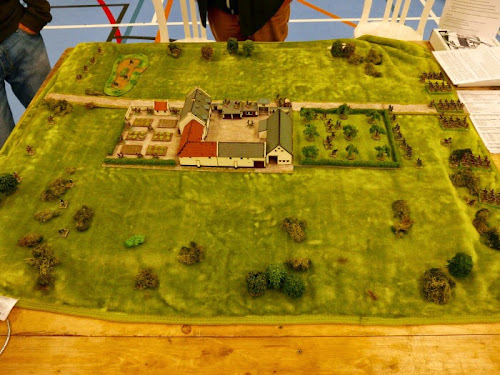 Nice figures and nice ground work. This period always reminds me of my Don Featherstone books. Above - I just loved these camels, again a very nice board. 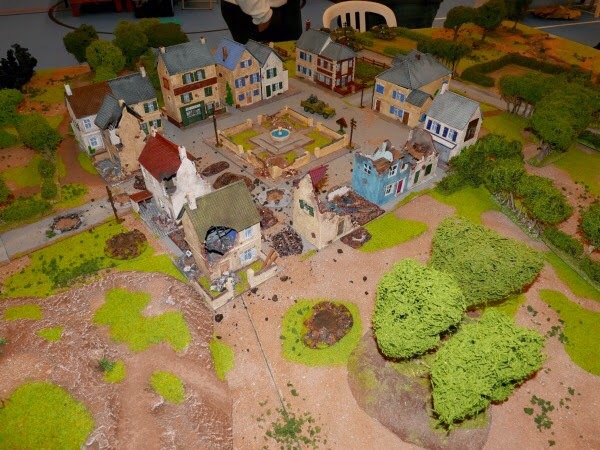 The standard of game surfaces at the show was overall very good. I didn't see a crumpled cloth once - which while OK at home, should not really grace a show. Above - Lovely dark ages in a massed block defending a hill top. This is actually a 3 unit section of the army and I had taken a few earlier shots, but preferred this one when they got their shield wall together. Above - Aaaagggghhhh ... I am really annoyed about this. 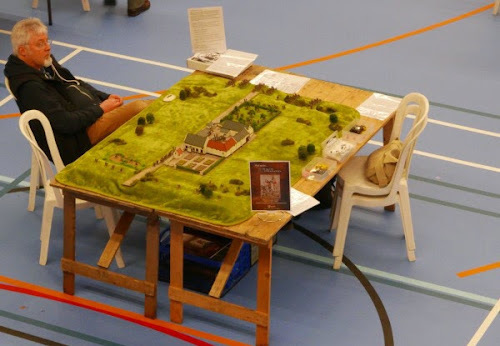 This is a shot of a gent putting out a 15mm game covering the battle of Bouvines. I think he represents the Society of Ancients, as there were slingshot copies next to him. Why am I annoyed - well I have deleted a bunch of shots from my camera of his full game! His game looked really nice when set out and he took the time and trouble to explain to me the combat system of Basic Impetus and talked about DBA v3 etc. It was my favourite part of the show. 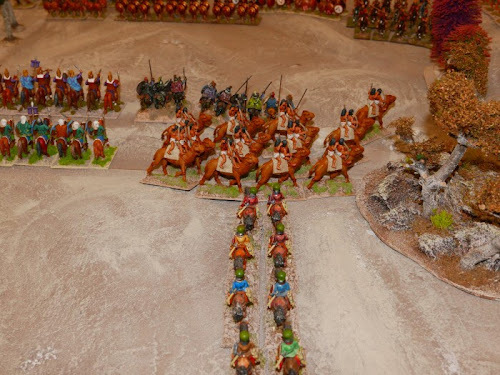 His armies looked really nice and he had a nice battle going in that 4 x 4 space (based on ceiling tiles) which interests me very much at the moment. I know I took photos of the full set up, but after the show I sat on a bench outside (in bright light) and deleted a bunch of pics and his must have been amongst them, so I am sorry that his picture does not really give him more deserved coverage. He has been there in previous years and his enthusiasm in sharing with others is always notable. Anyway, the two things that I really took from the show was how you could get a really good game with flanks etc in a 4' x 4' space with 15mm figures, which I thought looked a really nice scale (thanks to the Peter Pig table and SOciety of Ancients table). 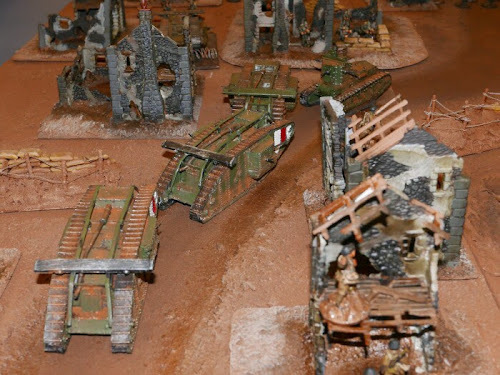 A quick chat with a young bloke on a table with a shed load of 15mm Shermans had me going off to traders and buying some sample bits. (I thanked him for his chat and told him that the time he had taken with me was going make me buy some pieces) I took a bag of 15mm Wars of Roses archers and WWII German infantry from Peter Pig (plus a 15mm Russian Church) to paint up and base and a 15mm WWII early Stug (Zveda) from caliver books. so I have my inspiration and something to new to investigate, the only problem is that I now have 10mm, 15mm and 1/72 on the painting table! 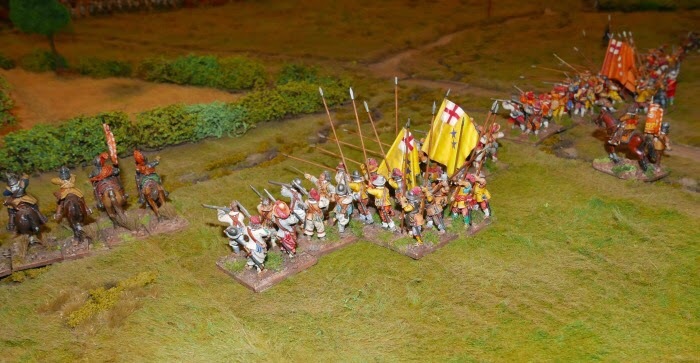 The rest of my purchases related to terrain, with my favourite being a large (28mm?) resin painted river system from Coritani. They were superb with me, the pack said it would cover 4' and had a 'Y' junction in it. I did not really want the 'Y', but did want some extra straight lengths, they just re-configured the pack and gave me a new price for the additional pieces - perfect, thank you. After having many river systems, I decided that even though I have a small table, if I am going to have a river, it needs to look substantial (i.e. a significant feature on the board) and so I went for the larger set-up, hopefully it will work for me, regardless of what scale I use. 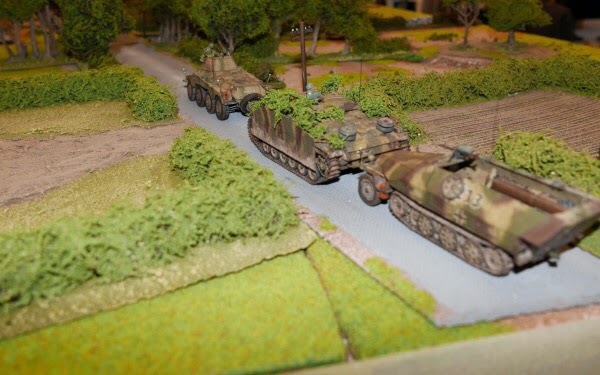 The bulk of my purchases were made at S and A Scenics, the most important being some wider roads. I have quite a bit of his stuff and everything bought always matches up with previous purchases. I also picked up a couple of MDF terrain items and some 60mm wide bases with a view to doing something pre-gunpowder at some point! Anyway, a great show that ticked all the boxes for me, gave me some new ideas, put some money in the traders tills and was just a nice treat sort of day. Thanks to all those who gave up their Sunday to make it work. Good review and completely agree about the smaller gaming tables. Most of my games at home are now on a 4'x4' table as it fits nicely into our dining room whereas a 6'x4' table is a bit too cramped. An enjoyable read of your grand day out. A great day out, lots of great games to look at, and a very friendly atmosphere. Lots of opportunities to spend money. Also a chance to meet a fellow blogger in the flesh for the first time. Thanks for posting the pictures, great report to. Great show report, thanks. I was enjoying it right up to the fire alarm and evacuation, I decided it was too wet to stand around outside so made for home. 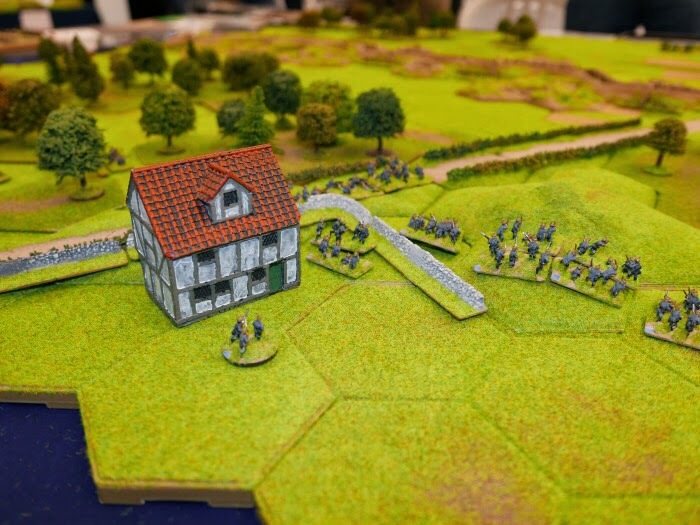 Some great games to see, especially that WW1 game in 28mm! Thanks for the kind comments about the Bouvines game ... and yes it was the Society of Ancients stand. I enjoyed our chat and the run through on Basic Impetus. Hi Phil, Nice to meet you and chat. Our conversation has moved me to explore a new project - thanks for taking the time to get me involved. cheers Norm.